Full Color Atlanta Vogue Name Badge - 3" x 1.5"
Go easy on your budget with this reusable plastic name badge with a window for employee names. 100% cotton custom compressed T shirts in the shape of a tire rim. Think of the marketing capabilities. 5.5 oz. Don't tire out the Earth's resources, get your company logo on this promotional pen made fully from recycled tires. Promote your tire brand with custom imprinted items from ePromos and kick your marketing campaign into high gear. 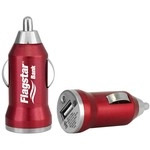 Promotional tire stress balls, promotional tire gauge keychains, custom tire themed beverage holders and more will move your company into the fast lane. Show those special clients your appreciation with personalized automotive sets and auto emergency kits to keep them safe on the road.